LOS ANGELES, CA (Jan. 22, 2013) -- Twentieth Century Fox Home Entertainment and WWE Studios unveil a brand new chapter in one of the most action-packed film franchises of all time with Marine 3: Homefront . The third installment starring WWE Superstar, Mike "The Miz" Mizanin and rising star Ashley Bell (The Last Exorcism II), throws down on Blu-ray and DVD on March 5. WWE superstar Mike "The Miz" Mizanin delivers a knock-out performance in the most explosive, action-packed Marine adventure yet. After returning to his hometown on leave, Sgt. Jake Carter learns that his sister has been abducted by a band of violent extremists. To save her, Carter launches a daring one-man assault on their base of operations...only to discover the group's ruthless leader is plotting a deadly terrorist strike. With time running out, Carter realizes he's the only man who can stop the impending massacre -- but this American hero may have to make the ultimate sacrifice to save thousands of innocent lives. 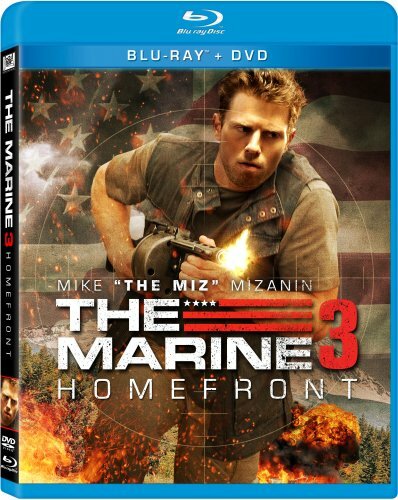 Showcasing one tough cast, Marine 3: Homefront stars Mike "The Miz" Mizanin (WWE Superstar), Neal McDonough (Captain America, Justified), and Ashley Bell. In preparation for the film, "The Miz" trained one-on-one with several production personnel, including stunt coordinator Ernest Jackson, armorer Robert Fournier and military advisor Darrion Holiwell. The movie was directed by Scott Wiper (The Condemned) and filmed in Vancouver, Mission and Maple Ridge, B.C. Jammed pack with adventure, explosions, and excitement, THE MARINE 3: HOMEFRONT is loaded with bonus material including behind the scenes look at the making of the film, and interviews with the cast. The DVD and Blu-ray allow fans to get an inside peak from filming on a derelict ferry formerly known as the Queen of Sydney, the 3100 ton, 336 foot vessel, built for the B.C. Ferry Corporation. Twentieth Century Fox Home Entertainment, LLC (TCFHE) is a recognized global industry leader and a subsidiary of Twentieth Century Fox Film Corporation, a News Corporation company. Representing 75 years of innovative and award-winning filmmaking from Twentieth Century Fox, TCFHE is the worldwide marketing, sales and distribution company for all Fox film and television programming, acquisitions and original productions on DVD, Blu-ray Disc, Digital Copy, Video On Demand and Digital HD(TM). The company also releases all products globally for MGM Home Entertainment. Each year TCFHE introduces hundreds of new and newly enhanced products, which it services to retail outlets from mass merchants and warehouse clubs to specialty stores and e-commerce throughout the world. WWE Studios continues to strategically diversify its slate of films, which includes theatrical releases and direct-to-home premieres, under the guidance of President Michael Luisi. Upcoming films for WWE Studios include: "Dead Man Down," which was co-financed with IM Global and will be distributed by FilmDistrict, starring Colin Farrell and Noomi Rapace; "The Hive," which was co-produced with Troika Pictures, starring Halle Berry and Abigail Breslin; "12 Rounds" and "The Marine" sequels, which were co-produced with 20th Century Fox and feature WWE Superstars Randy Orton and The Miz, respectively; "The Curse of the Ghost Bear!," an animated feature from Warner Brothers Animation that will find Scooby Doo and the gang teaming up with WWE Superstars to solve a mystery at WrestleMania; and "No One Lives," which was co-produced with Pathe Films and world premiered at the 2012 Toronto International Film Festival during Midnight Madness, and stars Luke Evans and WWE Superstar Brodus Clay.